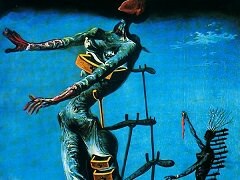 The Spanish painter Salvador Dali remains one of the most controversial and paradoxical artists of the twentieth century. 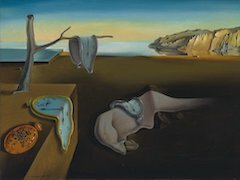 Over last few decades, Salvador Dali has gradually come to be seen, alongside the likes of Picasso and Matisse, as a prodigious figure whose life and work occupies a central and unique position in the history of modern art. Dali has also come to be regarded not only as its most well-known exponent but also, to many people, as an individual artist synonymous with Surrealism itself. 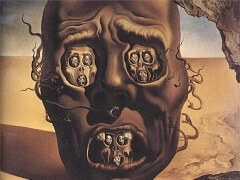 In addition, Dali was a great artist who was a great self-publicist and showman. The combination was an irresistible formula for success. Born in 1904, most of the works he did revolved around painting, sculpture work, and he worked as a graphic artist and designer as well. During the course of his career, he experienced many different art forms, and experimented with a few styles, allowing him to further his points of expression, and the design pieces which he created during the illustrious and extensive career that he had. 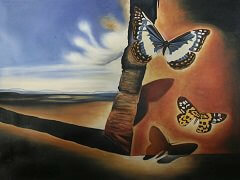 Dali is known to be a famous Surrealist and depicting this theme through his paintings and other art works. Most of his works show a sort of dream sequence which he often draws hallucinatory characters. His major contribution to the Surrealist movement is called the "Paranoiac-Critical Method" which is a form of mental exercise of accessing the subconscious parts of the mind to have an artistic inspiration. He used this method to realize the dreams and imagination ha have in his mind, changing the real world the way he wanted and not necessarily what it was. During his career, he focused on cubism, futurism, as well as metaphysical painting work, until in 1929, he joined the group of surrealists, and this art movement which he felt a connection to. His fame and notoriety, and talent in the art world, quickly made him a leading force in the Surrealist movement, and he became one of the representatives of the art movement during the 1930s. Salvador Dali cultivated exhibitionism and eccentricity in the work he created; not only in his art forms, but also in the way which he presented himself to the general public. In fact, in 1936, at a surrealist exhibition in London, he came to the show dressed in a dive suit, and made claims that it was a source of his creative energy. This timeless showmanship not only helped him through the course of his career, it also helped propel him as one of the leading artists in the Surrealist movement of the time. A well-read student of Sigmund Freud, Salvador Dali considered dreams and imagination as central rather than marginal to human thought. He also embraced the surrealist theory of automatism; he transformed this theory, into something that was seen in a more positive light, which he titled critical paranoia. Under the concept, he described how the artist should focus on cultivating a genuine delusion while still remaining aware at the back of their mind, that control and reason will be suspended for a period of time. Nowhere is the identification between the modern individual and the subject matter more evident than in Surrealism, where internal tumult is often envisioned as an external phenomenon, one iconic example of such works is Persistence of Memory, 1931. The fact that many Surrealists were committed to grounding their visions with realistic detail may initially seem as unexpected as the Expressionist Vincent van Gogh's debt to observation, until we remember that the name of the movement refers not to the nonreal but to the surreal. In 1937, Salvador Dali visited Italy, and during this trip, was able to experience many new art forms and creation pieces. During this trip, his work took a turn, towards a more traditional, and more academic style, in comparison to some of the earlier works he created as a surrealist painter. 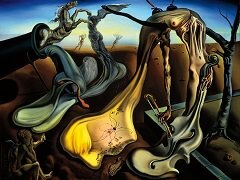 This change in his art form, along with the political beliefs which Salvador Dali held, caused Breton to expel him from the surrealist art movement. Shortly after, in 1940, he moved to the US, where he remained until 1955, experimenting in this new style and technique, and with new design concepts which he had adopted while in Italy. While living in the US and working there, Salvador Dali devoted much time, and much of his work, to the public, and self publicity. 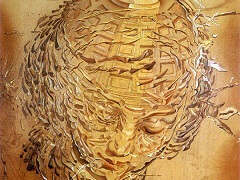 During this time, many of the pieces he created, revolved around religious themes and many distinct religious images. One such piece was Christ of Saint John of the Cross, which he painted in 1951. He also took an approach on sexual subjects as well, and many images he created were of his wife Gala. 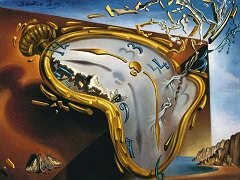 In 1955, Salvador Dali left the US, and made his way back to Spain. 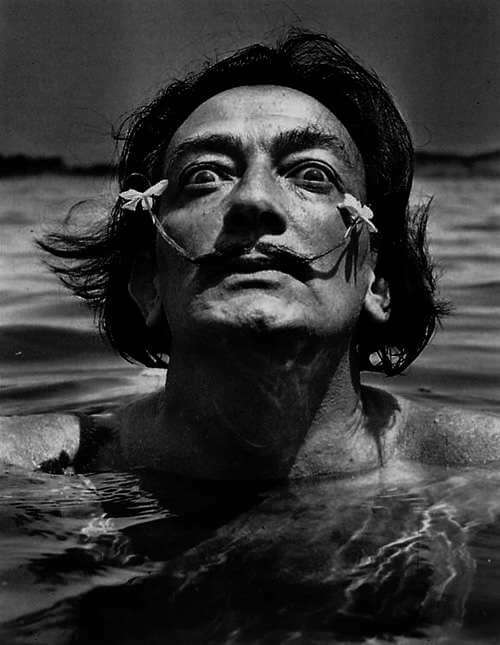 Although a majority of the work which Salvador Dali created were paintings, he also created sculpture works, design in jewelry, he worked on illustrations for various books and book series, and he also did a series of work for different theaters, and different shows which were performed in the theaters. Much of what Dali does has its roots in the great traditions of painting, and the artist has always freely acknowledged his debt to the great masters, such as Raphael, Donatello, and Diego Velazquez. His technique is traditional. His treatment of surfaces recalls Flemish painting of the time of van Eyck, and work of the Dutch little masters of the seventeenth century. He has painted still life resembling that of his great compatriot, Zurbaran. His drawing often has Renaissance qualities. His fantastic compositions have been likened to those of Hieronymus Bosch, and mythological and religious themes that he has used are centuries old. "Hidden forms" recur constantly in the history of painting, most recently in Redon and the Nabis, Bonnard and Vuillard. Some of Dali's later work, with splashes of paint or the effects of "shots" and "explosions", reminds us of what Leonardo da Vinci wrote in his "Treatise on Painting" quoting Titian, who said that "by throwing a sponge full of color at a wall it leaves a stain in which a fine landscape can be seen... as well as heads of men, animals, battles, rocks, seas, clouds and other things...In this you will find marvelous ideas because the mind of the painter is stimulated to new inventions by obscure things." 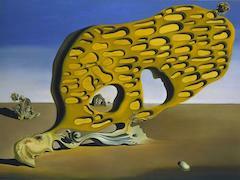 Just like William Shakespeare on literature, and Isaac Newton on Physics, Dali's impact on surrealism is tremendous. There is no denying that Salvador Dali is one of the most famous, and much appreciated artists of the 20th century; but, there is also much conflict that revolves around him, and the work he did. Many who are critics of the artist, claim that following the short stint that he had as a surrealist, he did very little, if any work that contributed to the art world, and to his career in general. On the flip side, there are others who appreciate his work, and visions. In fact, there is more than one museum that has been opened, which celebrates the artist, and which showcases quite a few of the pieces that Salvador Dali contributed to the art world, during the course of his career. Although actively engaged throughout his life in a serious dialogue with the history of world art which ranged from Renaissance Art masters Michelangelo, and Leonardo da Vinci to Cubism Pablo Picasso and Dadaism Max Ernst - Dali's aspirations always remained courageously and even chauvinistically of this continent. In the future, when Dali's paintings have fallen into the proper perspective with the work of artists of all periods, much that seems significant to us today may lose its interest. However, Dali will always stand out as one of the very few twentieth-century painters who combines a profound respect for the traditions of the past with intensely modern feelings. People will always look at his work because of his extremely personal and always surprising imagination, for that is where his genius lies.